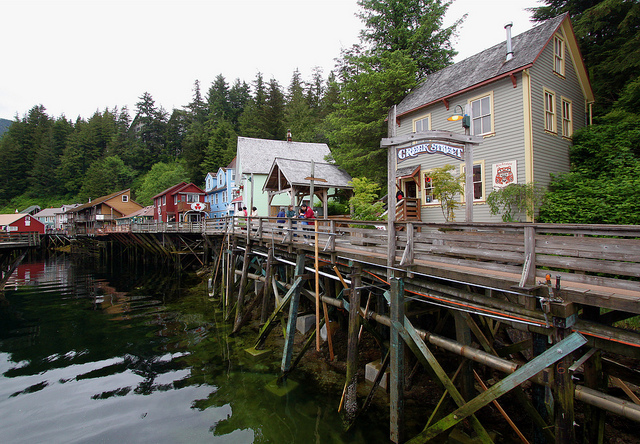 The best part of our Alaska cruise is, of course, the port stops! For our trip we will be visiting three Alaska ports of call: Ketchikan, Juneau, and Skagway, as well as sailing through Glacier Bay. I didn’t know ANYTHING about the cities we were visiting and I had to do a lot of research. I bought a couple guide books off half.com and also turned to travel sites like Cruise Critic and Trip Adviser. We are taking at least one organized tour in each port, and will also have some time to explore on our own. It’s going to be a whirlwind week! After this and the Mediterranean, I’m going to be ready for one of those cruises where you stop at a different beach each day and all I have to worry about is which bathing suit to wear! In Ketchikan we will be doing a Rainforest and Totem Hike with Wild Wolf Tours. This is only a three hour tour so for the rest of the day we will be just walking around the city. A popular tourist trap is Creek Street, a boardwalk built on pilings above a creek that runs through the city. Back in the gold rush days it was a popular spot for “adult recreation” but now it’s mostly shops and museums for tourists. For eats, Creek Street Grill has great reviews and looks like reindeer dogs are on the menu; I might have to give them a try! Poor Rudolph! 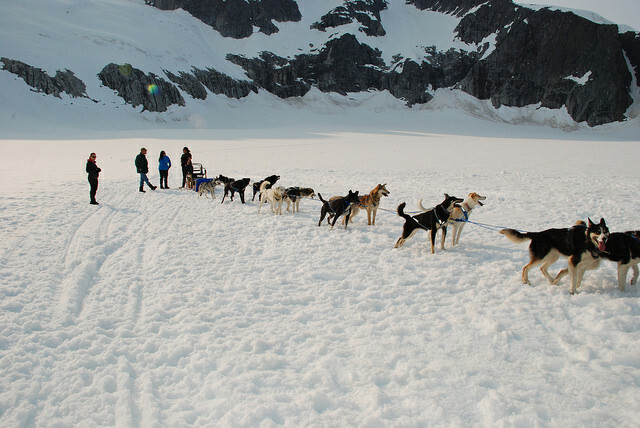 In Juneau, we are dog sledding on a glacier with Coastal Helicopters! I’m so excited for this. I get to stand on a glacier! Mr. BFT has a friend who’s a local and he gave us some recommendations for restaurants, and Red Dog Saloon seems to be a popular stop for cruisers. Then for two days we will be sailing through Glacier Bay and past Hubbard Glacier! We aren’t getting off the ship but these are attractions in themselves, so I think the scenery will keep us busy. We disembark in Whittier, which I don’t know much about! We are doing a transfer shuttle tour from Whittier to Anchorage, which will take up most of the day and show us a lot of the scenic sights in the area, including stopping at an animal sanctuary. Then we will spend a couple days in Anchorage. I am so excited for this trip!! 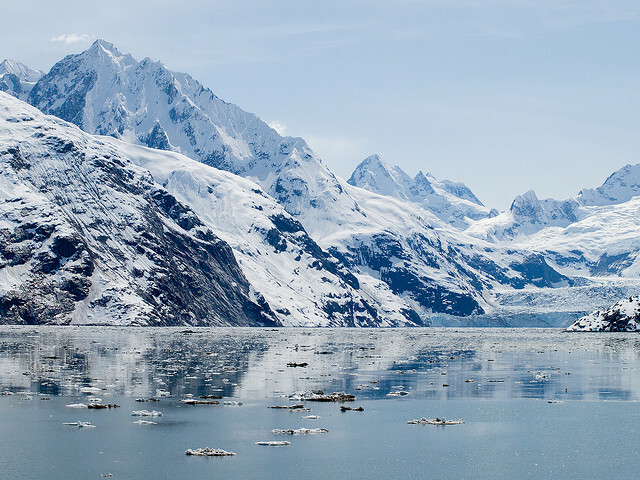 Have you been on an Alaskan cruise? What was your favorite port? I’m so jealous! Have a ton of fun! We had a lot of fun at Red Dog Saloon – total hole-in-the-wall with reindeer sausage and great live music, plus it’s super close to the port. 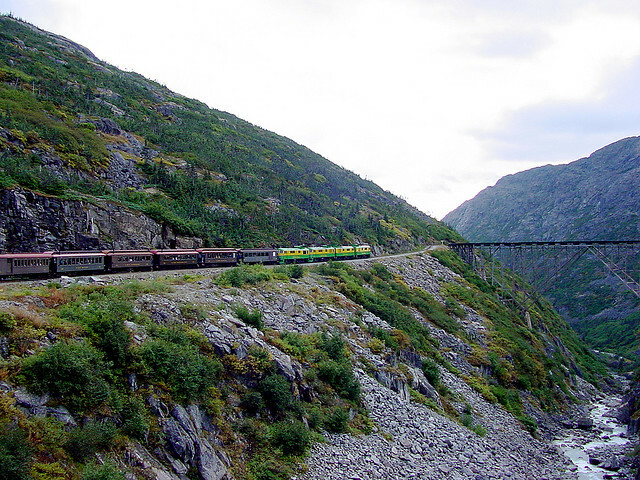 I think my favorite place was Skagway – the train was so fun, and we also took a walk to the Gold Rush cemetery, which I thought was pretty interesting. I also just really loved Glacier Bay. So much fun to grab a hot chocolate and take in the scenery. They usually have a guide get on board the ship and tell you about the glaciers. Have so much fun – eat a lot of tasty food – that’s my favorite part of cruises.